Suranga Lakmal tore through the New Zealand top order to pick up five wickets, but Sri Lanka failed to press their advantage, losing four early wickets themselves. Lakmal had the home side bowled out for 178 on Wednesday, 26 December, the first day of the Boxing Day Test in Christchurch. It was only Tim Southee's typically brisk fifty and a century partnership with BJ Watling that gave New Zealand something to defend. Southee then made a fight of it with ball in hand, sending back the Sri Lankan top three with just 21 on the board, as the visitors' frailty against the new ball continued. They finished the day on 88/4, still 90 runs behind. Angelo Mathews, who guided Sri Lanka to an unlikely draw in the first Test, was batting on 27, with Roshen Silva for company on 15. Dinesh Chandimal chose to bowl first at the toss, having brought in Dushmantha Chameera and Silva. Lakmal took the new ball and went on to bowl unchanged for 16 overs, getting regular wickets. Jeet Raval was the first to fall, edging one that was going down leg, in the ninth over. Tom Latham, the double-centurion of the previous game, edged to slip, while Kane Williamson was caught behind and the movement proved too much for Henry Nicholls. Ross Taylor's rebuilding work was undone by an unfortunate run-out soon after lunch – his fourth in Boxing Day internationals across formats. Watling drove straight, but Lahiru Kumara got his fingers to it on its way to the stumps at the non-striker's end. It took an aggressive Southee, who swung his bat for a couple of boundaries and a six, to finally force Lakmal off, after a spell that read 16-4-42-4. The New Zealand No.8 lived dangerously in smashing three sixes and six fours in his innings of 68 off 65 balls. The half-century came off just 43 deliveries as he dominated the seventh-wicket stand worth 108. A special catch from Danushka Gunathilaka, who timed his jump to perfection and held on with his right hand at mid-on, saw the end of Southee. Watling was the ninth wicket to fall, soon after tea, and the innings folded in exactly 50 overs. Trent Boult and Southee got nice shape with the new ball, and the pressure told. 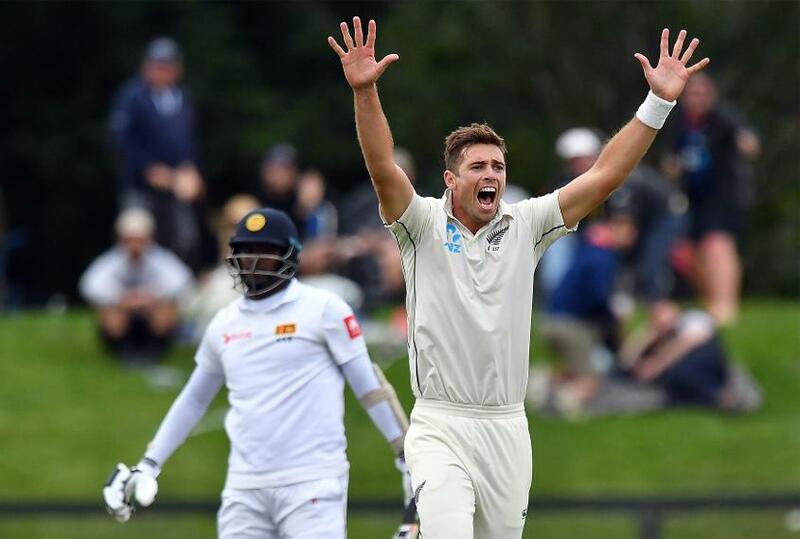 Southee got Dimuth Karunaratne and Chandimal to nick, while Gunathilaka succumbed to an injudicious pull. Matthews lost Kusal Mendis, his partner from the epic fightback last game, but looked mostly comfortable. Against quality seam bowling, he was watchful for the rest of the day, taking his team to stumps without further hiccups.